Indie puzzle platformers seem like they're a dime a dozen these days. 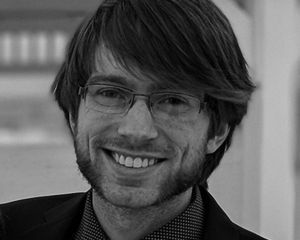 Start with an art style, something unique or just simple pixels, add some cool gameplay hook, and then make some levels. It’s a standard formula that has proven successful in the past, but has also marched towards oversaturation. It is very impressive, then, that The Bridge is as captivating as it is. With clear inspirations taken from games like Braid and P.B. Winterbottom, The Bridge combines M.C. Escher-esque level design with a world-shifting mechanic to form one of the best puzzle games that I have played in years. The plot of The Bridge is never outright explained, and the main character is never actually named, although it should become painfully obvious who it is once the game begins. The story unfolds through the environment and some post-world text instead of any cutscenes or monologues. The plot is intentionally obtuse, but there are plenty of hints to provide enough direction to the player to start to figure things out. It's interesting enough to keep the player engaged, and I even found myself wanting to progress, not only to see the next puzzle, but to learn more about just what the heck was going on. The plot is bleak in tone, perfectly matching the game's aesthetic to create a marvelously morose theme. 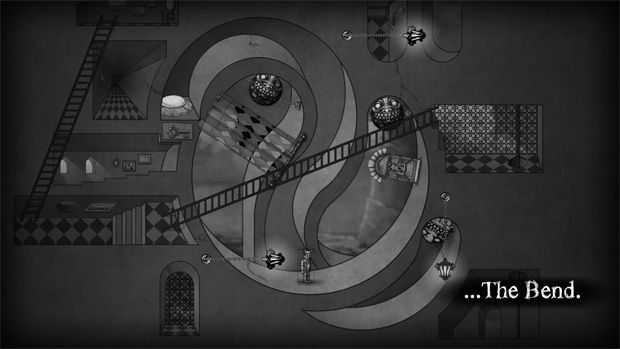 The game's central mechanic is rotating the world. Using the arrow keys, the player can rotate the world, forcing the main character and any other objects to fall downward -- wherever that may be. The character himself is controlled with W and D to go left and right, respectively. Like any good puzzle game, it starts off simple enough and eventually ramps up sufficiently to leave you scratching your head for a long time. New obstacles and mechanics trickle in to keep things fresh as the player progresses. There are four worlds, each with six levels. Once I finished these four worlds I felt accomplished, but it left me feeling as if so much more could be done. Then I unlocked the Mirrored Worlds. Holy crap did I get what I wanted! The first four worlds are comfortable, never becoming too difficult (except perhaps the last level), and do a good job of introducing the base mechanics. The Mirrored Worlds, then, expand upon those base mechanics, add a few more, and drastically increase the difficulty. No one idea ever gets overused or starts to feel stale, as the game is constantly switching between different mechanics and concepts. The difficulty in these Mirrored Worlds can be a bit of a roller-coaster, as opposed to the expected gradual incline. There were some levels that took me around 20 minutes to complete, followed immediately by a level that I managed to solve on my first attempt. In the grand scheme of things, the difficulty feels appropriate the entire way through and culminates in an incredibly difficult final set of puzzles. The solutions to some puzzles, however, eventually boiled down to throwing ideas at the wall in order to see what stuck, leaving me with very little satisfaction after completing them. Luckily the game includes a rewind feature, allowing you to undo mistakes or moves that simply did not work. There are still plenty of "a-ha!" moments throughout the various puzzles, which in fact make the trial-and-error puzzles stand out that much more. There are seven collectable "Wisps" scattered throughout the game, some of which are in some very hard to reach places. There are hints scattered about on the Internet, and they will definitely be needed if you wish to go after all of them. The payoff isn't quite as grand as I would expect for such an obscure and difficult task, but it does seem to flesh out the plot a teensy bit more. 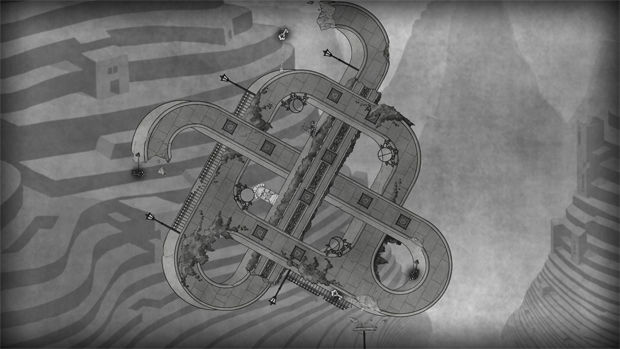 The game's puzzling nature is largely due to the level design, inspired by the art of the famous M.C. Escher. Due to the impossible nature of this design, it is often best to try an idea that seems like it might not work, since it may be exactly what needs to be done. An M.C. Escher quote epitomizes this idea well: "Only those who attempt the absurd will achieve the impossible." 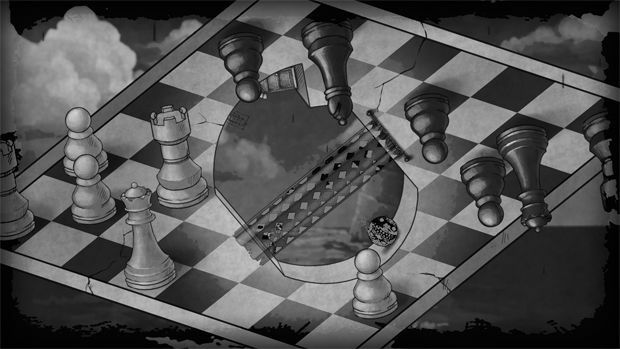 The entire game is in grayscale and is the biggest contributor to the game's overall grim theme. Objects such as the main character and obstacles look as if they have been sketched onto the world, constantly animated even while still. The music is great thinking-man's music. Whenever I would hit a wall, I would alt-tab and the music would continue to soothe my ears as I took a break and gave each puzzle some more thought. The Bridge surprised me multiple times during the eight or so hours I played it. It surprised me with the devious simplicity of the level design, the dark theme that permeates the entirety of the game, and I was especially surprised by how satisfying the game was as a whole. Some of the puzzles are a bit of trial-and-error since the more complicated mechanics take a certain amount of experience to fully understand. The difficulty can also be a bit wonky at times, alternating back and forth between "hard as a five star Sudoku" and "easy as a word search." Despite these issues though, The Bridge is an experience that I haven't had since P.B. Winterbottom and Braid, and it gives both of them a run for their money. Together, these three games now constitute my Holy Trinity of puzzle games.